Radio is Back! Kill your ipod! Breaching the airwaves with a new breed of sound: Transmitting from two studios in the former east and west parts of the city, a new radio project marks the crossings of many cultural communities for the next three months. Herbstradio is a continuation of an ongoing international experiment: how to map the complex patterns of urban culture's producti vity and transport it into the ether? While other cities around the world have permanent "free cultural radios", Berlin has only realized this in temporary forms. Partly, Herbstradio is a tribute to Berlin's potential to realize a permanent cultural channel like Resonancefm London; WFMU, NYC; Grenouille, Marseilles; Tilos Radio Budapest; Orange, Vienna and Corax, Halle or the former Radio100, Berlin. Herbstradio proposes to better promote all the cultures of a city which make it vivid and livable but are mostly excluded from the media sphere, living in the "long tail" of interim residues of micro-local and digital niches. A large portion of the population in Berlin is not part of the mainstream and probably never will be: with a migration background, as temporary cultural workers, or in permanent underground exile, they create different cultural spaces. Cosmopolitan diversity is a given condition which drives and inspires cultural institutions and events as well as everyday life. Local and far away stories and sounds stand for themselves but also blend and mix while radio opens up a shared timespace right in your car, office or kitchen. Cultural production after the global crisis of capital needs to find its place between the offerings of the creative industry and your friendly facebook friends. Money probably isn't the only means to measure productivity these days. A low budget project can still filter a considerable amount of interesting cultural data for you. Watching the music industry change, one can sense an uncertain future where distribution is free and incomes are low. Herbstradio operates on the assumption of a universal flatrate model, where everything is available but choice needs effort. The isolated ipod user is overwhelmed with the task of permanently reorganizing individual playlists, while free cultural radio offers a social context where relevance can emerge from locality and surprising moments of commonality. New forms of collective subjectivity production are needed which connect the physical plane of living together in a locality with the abstract sphere of social data on the internet. How to organize the unorganizable? How much information you want to digest has to do with your capability of how long you can stay up to go clubbing. Then again, how many interesting lectures did you miss? For those who cannot be at the same place at the same time, radio offers a way to include people and extend the social range of a niche. While the globe goes digital, the local analogue strikes back. radio is the new vinyl. You can travel through a city like you can consume a website. Herbstradio allows you to dig a little deeper. It will capture more than just a glimpse of events, discourses or musical styles without trying to be journalistic, objective or representative. This is rather a part of the fabrics which hold the city together and drive it, to develop the electromagnetic senses which connect it to the past and future. Check out the podcast and livestream or tune in to the FM broadcast. Jochen Becker, Franco „Bifo“ Berardi, Kiran Cantuerk, Paddy Catani, Chaosradio, Chaussee der Enthusiasten, Chicks On Speed, Club der Polnischen Versager, Mike Davis, Till Nicolas von Heiseler, Heinrich „DJ Officer, Officer„“ Dubel, Dmitry Kleiner, Kodwo Eshun, Harun Farocki, Hausradio, Andrej Holm, Darius James, Jahcoozi, Grada Kilomba, Karsten Krampitz, Brandon Labelle, Geert Lovink, Liebe Statt Drogen, Meena Menon, Mikro.fm, Alla Mitrofanova, Multicult2.0, Carsten Nicolai, Orient Taxi, Tanja Ostojic, Polyphon, Radijojo, Radio Hochsee, Radio Voodoo, Reformbühne Heim und Welt, Salon Bruit, Hito Steyerl, Surfpoeten, Peter Lamborn Wilson and many others. B_Books, Berliner Märchentage, Club Transmediale, General Public, Haus der Kulturen der Welt, ICI Berlin, Internationales Literaturfestival Berlin, Make Capitalism History, Metrozone, Next, Pro Qm, Radia.fm, Transitland Destination Berlin, Vattenfall 20. Herbstradio is organized in a cooperation between Hausradio/Klubradio and Radiopiloten/Brotfabrik and is a combination of two radio projects: REWIND2020 and Berlin macht Radio. Hausradio, a cooperation between klubradio, Next Intercultural Agency and the House of World Cultures is a substantial part of Herbstradio. 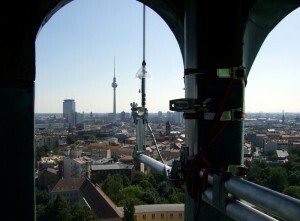 The transmitter broadcasts from the tower of the Segenskirche in Schoenhauser Allee. This is not only the point of broadcast, but also the point where the signals from the two studios join: from Radiopiloten at the Freudenhaus Lottumstrasse (Prenzlauerberg) and from Klubradio at the Haus der Kulturen der Welt (Tiergarten). The Project Rewind2020 is supported by a grant from the Haupstadkultur Fonds.